Store-bought ribs give you slow-cooked flavor without all the hassle. Whip up a few simple sides like baked potatoes, corn on the cob or pasta salad, and you've got a meal in minutes that tastes like it took hours to prepare. Precooked ribs can be heated up in the oven, the microwave or on the grill. If the ribs are frozen, be sure to thaw them completely before cooking. Remove the ribs from their packaging and place them in a baking dish. Cook the ribs until they are warmed through, about 20 minutes for a 16-ounce rack of ribs. Brush the ribs with additional barbecue sauce occasionally, if desired. Prepare your grill for medium heat. For charcoal grills, light the coals until they are gray with ash. For gas grills, simply set all burners to medium. Clean the grill grates and brush lightly with oil to prevent the ribs from sticking. Remove the ribs from their packaging and place them on the grill directly over the heat source. Brush the ribs with a thin layer of barbecue sauce every few minutes. 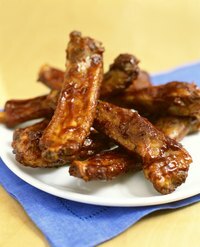 Applying thin coats allows the sauce to caramelize on the ribs and become slightly sticky instead of soupy. Cook the ribs, flipping occasionally, until they are heated through, about 10 minutes for a 16-ounce rack. Remove the ribs from their package and place in a microwave-safe dish large enough to hold the ribs comfortably. If the ribs are too large, cut them into smaller portions to fit into the dish. Cover the dish with a paper towel to prevent sauce from splattering in the microwave. Microwave the ribs on high for 5 minutes. Check the temperature of the ribs. If they aren't heated through, continue microwaving them in 2-minute intervals until they are sufficiently warmed. If you're cooking the ribs in the oven or microwave, a quick trip the broiler after heating will caramelize the barbecue sauce and help it stick to the meat. Brush the ribs with a thin layer of additional sauce, then flip them once during broiling to caramelize the sauce evenly on both sides. Serve the ribs with a bowl of your favorite barbecue sauce to allow guests to dip into additional sauce while they're eating. Precooked ribs often come slathered in sauce, but you can give the ribs a personalized spin by brushing them with a simple homemade glaze. Mix honey, maple syrup or brown sugar with a flavorful vinegar like Balsamic or apple cider, use a few tablespoons of soy sauce, Worcestershire sauce or Dijon mustard, or add dried spices like garlic powder, ground ginger and chili powder to give the glaze complex flavors. Reserve the meat from one or two ribs and mix it into baked beans or barbecue beans for a quick side dish with complementary flavors. Always heat precooked foods to a minimum internal temperature of 165 degrees Fahrenheit to ensure safety. Insert an instant-read thermometer into the ribs in several places, away from the bone, to get an accurate temperature reading.